On March 7, 2011 the Riga Latvian Society started to implement the project “The Output and implementation of the programmes for intercultural dialogue and communication skills’ development for persons who provide services to third countries’ citizens”. 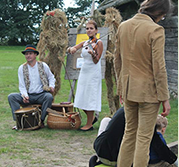 The Project in Latvia was managed by the Ministry of Culture in the framework of the European Third Countries Nationals’ Integration Fund’s programme of the year 2009. The Riga Latvian Society for the first time implemented the European Union project, receiving significant funding - 34775, 70 lats, including European Third Countries’ Nationals’ Integration Fund’s financing – 26081,77 lats and national co-financing – 8693,93 lats. Project’s “The Output and implementation of the programmes for intercultural dialogue and communication skills’ development for the persons who provide services to the third countries’ citizens” aim was to develop 5 training programmes and materials of intercultural dialogue and communication skills development, improving the competence of public servants, local government representatives, social workers, societies’ and foundations’ representatives and teachers who provide services to the third country nationals, representing different cultures and traditions. All 5 programmes have been put in practice, teaching the targeting persons and developing cooperation models to make them become the intercultural multipliers. In the implementation of the project, were held training courses from April 18 to June 3 in Riga, in the Riga Latvian Society house and in Rēzekne. At the end of the training courses the participants received the certificate. The training programmes and courses were developed and led by the outstanding specialists in their field - tradition historians, university teachers, cultural and educational specialists. „The theatre play as a method of integration of different ethnic groups and national traditions”. The authors of the programme - directors, cultural columnists - Margita Poriete and Pēteris Vilkaste. In the conclusion of the project and the evaluation of the results, on June 29, 2011 at the Riga Latvian Society was held the final conference "To understand each other in the diversity of the world”. The 5 free training programmes learned 200 employees of state authorities, local governments, social workers, associations and representatives of foundations, teachers and other professionals whose daily work is related to the nationals of the third countries and who organise their people's cultural activities. More info: project manager Lauma Celma (tel. 27043170, projekts@rlb.lv). This publication has been made with the European Third Countries’ Nationals’ Integration Fund’s financial aid. For the content responsible is the Riga Latvian Society.